On Thursday, Sept. 6, and Tuesday, Sept. 11, the last two of three town halls were held by administrative staff to share progress on the A Path Forward initiative. The forums, titled Health and Well-being and Academics respectively, were coordinated to present updates on the effort to improve student life and enhance mental health resources and academic programs across campus. Some changes completed include new offerings by the recently expanded LGBTQIA Resource Center and Tech Health Initiatives. Starting this fall, Health Initiatives will start offering group wellness coaching. The program is largely student-oriented as students are grouped with peers with similar aspirations and work alongside a coach to progress towards a determined goal. The construction of the Intake Center is a longer-term goal the administration has pursued. The center, which is estimated to be completed in 2022, will focus on streamlining the process of planning and scheduling counseling and psychiatry sessions. A temporary center will be opened at the Smithgall Building starting Spring 2019 and will run until the permanent center is opened. One new permanent source of funding for mental heath programs is the Brandt-Fritz Endowment for the Dean of Students. The endowment, totaling $2.5 million, is expected to generate $100,000 per year. The allocation of funding is at the discretion of the Dean of Students, currently held by Stein, though it can only be used for specific purposes per endowment restrictions. In the upcoming semesters, the administration also plans to establish a Mental Health and Well-Being advisory board composed of both students and faculty. “[The board] will meet a few times each semester and look at the whole health and well-being piece at Georgia Tech and the progress we’re making and find ways to stay in communication with students, faculty, and staff,” said Stein. Nate Knauf, third-year CS and SGA CoC representative, was keen to point out the issue of permanent staffing and hiring during the open discussion. In 2017, the Mental Health Action Team Report recommended the student to counselor ratio be lowered to the nationally recommended ratio of 1000 to one—it stood at 1578 to one in last year’s report. The Mental Health Action Team was one of three teams assembled by President G.P. “Bud” Peterson in Oct. 2017 to gather recommendations and identify key issues regarding mental health and community support. These action teams reported their findings in Nov. 2017, and all of them have been published online. Currently, there are ten full-time certified clinical staff, a number significantly smaller than the 30 recommended to account for the entire student body. “One of the first blocks to that is having sufficient space. I do not have thirty offices in the counseling center,” said Dr. Carla Bradley, who became the new director of the Counseling Center in July. As for changes in academic course offerings, certain core and elective courses will now incorporate LGBTQIA-relevant course material. 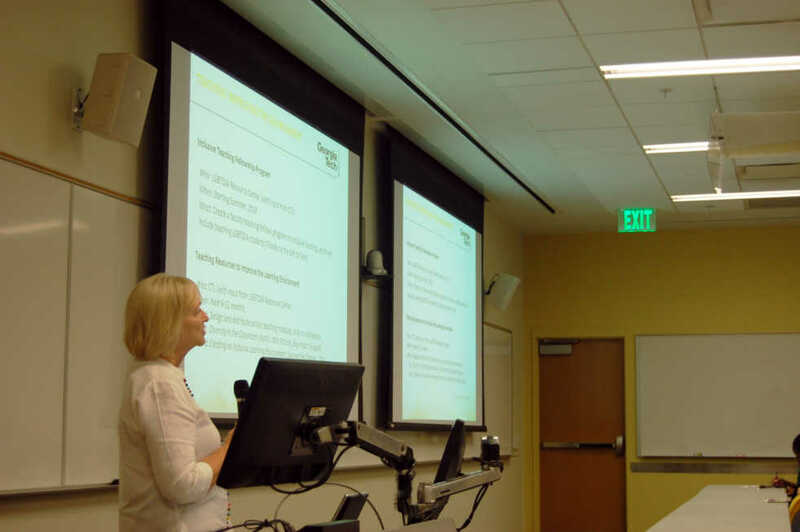 Within the upcoming year, the Office of the Provost aims to simplify the GT1000 curriculum to emphasize the diversity of individual strengths. To address the graduate student population, a graduate student equivalent of GT 1000 was created, called Grad Group, with the intent of promoting resilience and reviewing student stress. Administrative staff will also review institute health requirements impacting first-year physiology courses. On Friday, Sept. 14, a memorial will be held for Scout Schultz at the Smithgall Center in Room 117. Schultz’s death a year ago prompted administration to begin to prioritize mental health and academic resources across campus.